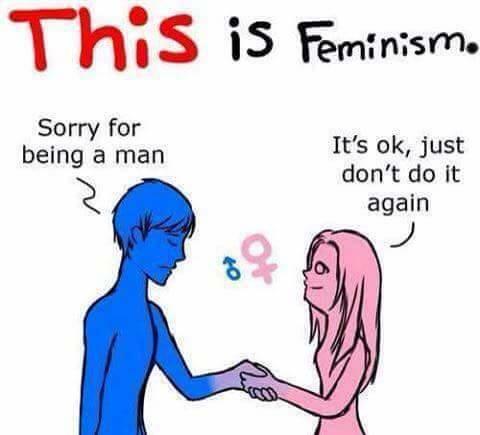 What does This is Feminism mean? 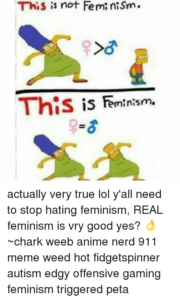 This is Feminism is a meme centered on the idea that considering women better than men is not true feminism, but equality between men and women is. It was appropriated by men who are critical of feminism. Where does This is Feminism come from? 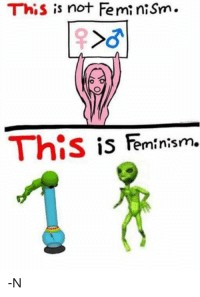 The original This is Feminism meme (below) was posted by an artist, with the username bilbos-buttons, on Tumblr on June 26, 2013. The image plays on the idea that some more “radical” feminists believe that women should be superior to men. Instead, the artist is insisting, feminists should advocate for equality with men. 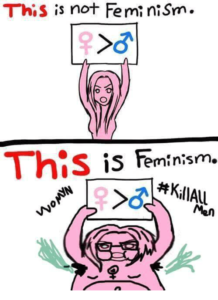 The notion that feminists hate men, which is alluded to in the original meme, was emphasized in an early take on the meme posted to 4chan in July 2014 where the word feminism was replaced with equality in the bottom panel. 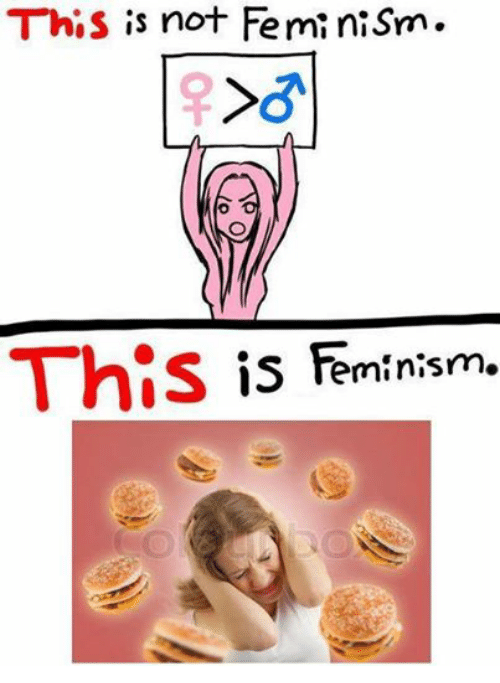 Countless later versions of the This is Feminism meme replaced the bottom panel with something humorous like aliens, a Joseph Stalin Bugs Bunny, and a woman being attacked by hamburgers. 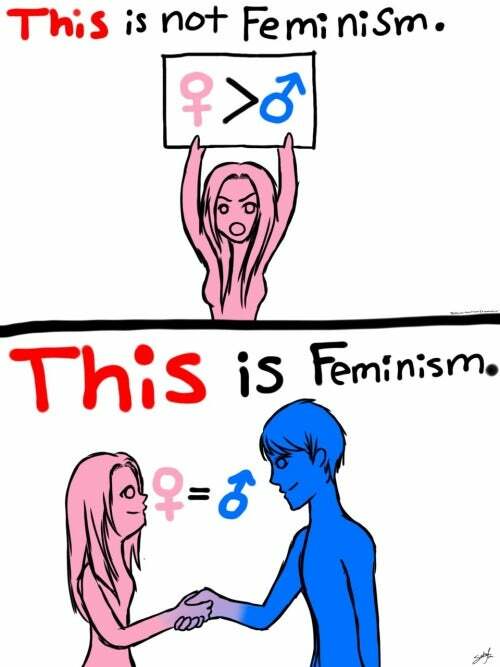 In March 2016, Instagram user antifeminism27 posted a new illustration of the This is Feminism meme, where the final panel had been changed to further stereotype the man-hating-ness of feminists. 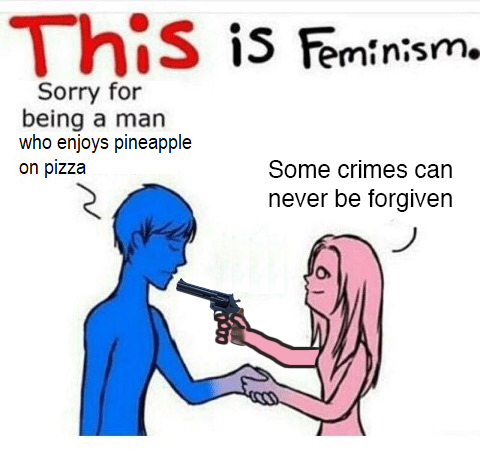 In the controversial subreddit r/TheDonald, user Folkov posted yet another modification of the This is Feminism meme where the woman is pointing a gun at the man captioned “Some crimes can never be forgiven.” This generated its own subcategory of antifeminist This is Feminism memes that wrongly equated feminism with hating men. Who uses This is Feminism? The This is Feminism meme has spawned countless iterations, some serious, some silly, and many, true to internet form, absurd. 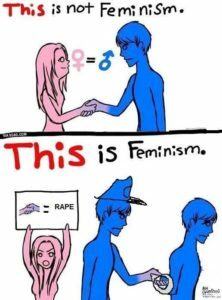 Some users post the original image to demonstrate their support for equal rights for men and women under feminism and renounce “radical” feminism and misandry. However, as the later iterations of the This is Feminism meme make clear, the meme is particularly popular amongst those who are skeptical, if not downright hateful, about feminism and its goals, such as men’s rights activists (MRAs).